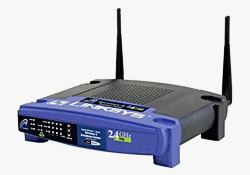 Wireless Networks are those in which the interconnection betweendevices is established without using wires. The nodes communicate using radio waves. The wireless adapter in a computer translates data in radio signals and transmit it. The wireless router receives the radio signals, decode it and sends the data to internet. Of course this process also works in reverse manner. A wireless network is usually called as Wifi or WLan. The main advantages of Wireless Networks are that users are not bound to areas to plug into a Wall jack to connect to network and also it reduces the cost of cable used in Wired Networks. easily compromised if they are not properly configured. differentiates one from another. Simply it is the name of a network. It is the point from where wireless network signals are generated. WAP is a device that receives radio signals from computers in network and send them to router. It is the MAC address of WAP or wireless router. It is a unique 48 bit key. These are wireless packets which are broadcasted to maintain the connectivity between WAP and the computers in network. The WAP broadcasts beacons from time to time to check connectivity with computers. WEP is an encryption scheme used to encrypt the WiFi data streams. WEP encryption uses a 64bit or 128bit key. A WEP uses the combination of an encryption key and Initialization Vector (IV). IV is any 24bit random number and is attached to encryption key to make it difficult to crack.64bit WEP encryption uses a 40bit key and 24 bit IV. Similary 128bit WEP encryption uses a 104 bit key and 24bit IV. 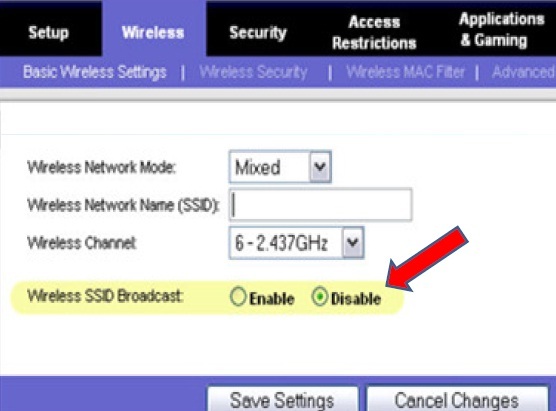 The users/clients connection to the wireless network need to enter the correct WEP key to gain access to network. It protects the wireless data by encrypting them and allowing decryption by users who have correct WEP key. The WEP key can be easily cracked by an attacker because size of IV that is 24bit is very short.The vulnerability in WEP is that an IV which is randomly generated is repeated after certain number of packets as it is short (24bit) and less number of combinations are possible. Due to this insecurity, Wi-Fi Protected Access(WPA) and WPA2 security protocols were released. They provide more security by generating complex and dynamic keys which are hard to crack. The method of creating IVs and encryption keys was improved. WEP,WPA,WPA2 are secure in increasing order. recognised. The administrator might let the only the particular clients to connect to network by checking whether their MAC address is present in the list of registered MAC addresses or not. hich have not been in use for a long time. This security mechanism can be bypassed by attacker by spoofing his MAC with already a registered one. Do not simply broadcast the SSID. It lures the attackers or War Drivers to break into the networks. Wirelessdevices can only connect to WAP if the SSID is known. Using an encryption scheme like WEP,WPA or WPA2 is must for Wireless administrators. A WEP doesn’t matter how long it is, can be cracked in minutes. So WPA or WPA2 is recommended. Completely securing a wireless is hard. But is easy to moniter what is going on in a network. IDS monitors traffic and alerts the administrator when something unusual is happening or traffic matches any predefined pattern of attack. Many open source products like AisSnare, Snort-Wireless,WIDZ etc are available for the same purpose.